Drago Centro has debuted its Winter Cocktail Menu, the first seasonal list created entirely by Bar Manager Jaymee Mandeville after previously collaborating with former Beverage Director Michael Shearin. Earlier this week, Mandeville hosted a tasting of her new menu, on a crisp night that reminded us it was only a few days before the winter solstice. The drinks are listed alphabetically on the menu, but Mandeville mixed the ten cocktails in a progression that ensured our palates could make it through the entire tasting. 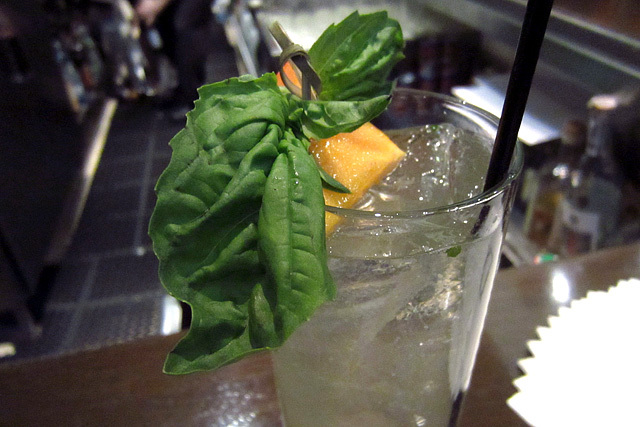 We began with the Fated Seeds: Nolet’s Gin, housemade persimmon shrub, Miracle Mile Bergamot Bitters, basil, soda water. 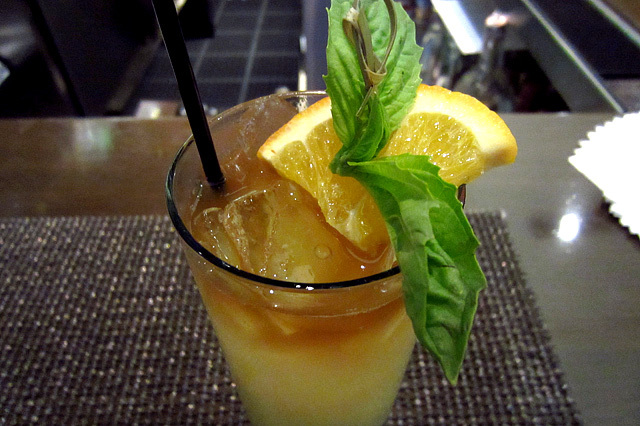 It may be the winter menu, but this tall drink would be a perfect sipper for warmer months (if only persimmons were in season). The Fated Seeds is bright and refreshing, with the Nolet’s distinctive floral notes offset by the tart, sweet shrub and balanced by the soda. 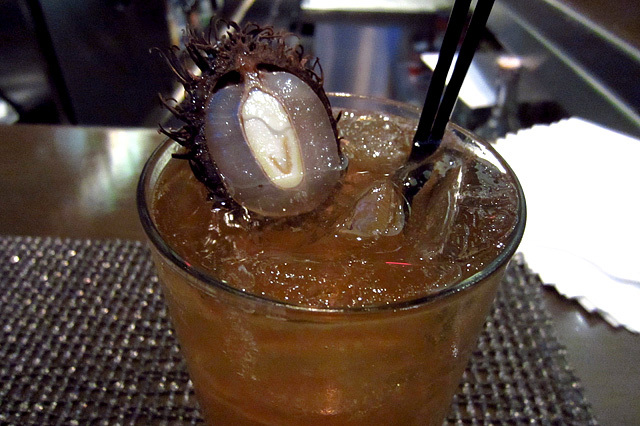 The drink’s name comes from the folk tale that says you can predict the severity of the upcoming winter by cutting open a persimmon seed. Depending on whether the kernel inside is shaped like a spoon, fork or knife, the snowfall will be heavy, light, or “cut” by icy winds. My first glance at the drink list had already singled out the Rode Duivel (“Red Devil”): Bols Genever, Santa Maria al Monte Amaro, Miracle Mile Sour Cherry Bitters. 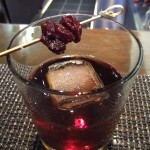 Quite the libation, especially when the malty genever and menthol qualities of the amaro start to open up. 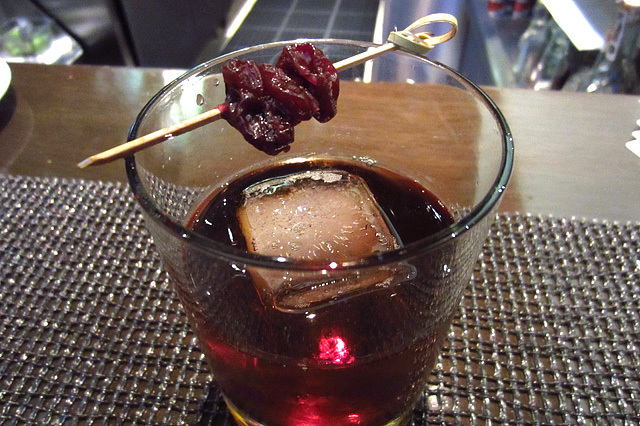 And this may break protocol, but nibble on the dried cherry garnish and take a sip for added enjoyment. The Silver Screen Quotations does a great impersonation of movie theater Red Hots: 123 Blanco Tequila, housemade Thai chili-cinnamon syrup, red bell pepper, mint, lime. Nicely balanced with a gentle kick of heat at the end. 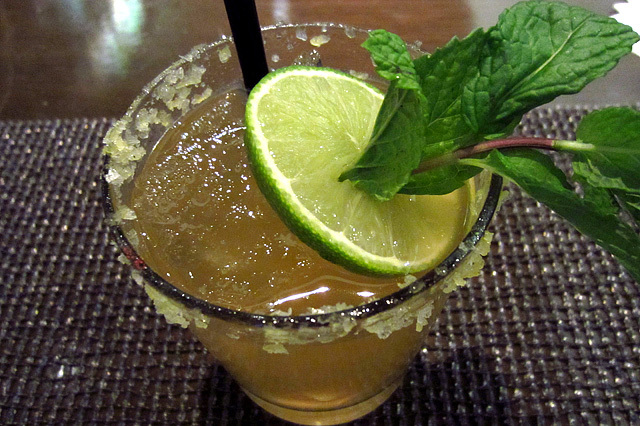 Try sipping it without the straw to fully appreciate the saffron salt rim. The Western all’Italiana (the Italian term for “Spaghetti Western”) had also caught my eye, and not just because it’s named for one of my favorite movie genres: High West Double Rye!, Cointreau, St. Elizabeth Allspice Dram, cranberry-oregano infused molasses, Gala apple. Another winner that’s full of winter spice and depth, its color a red that’s as deep as the blood spilled in a Sergio Leone shootout. Then came a perfect holiday cocktail, the Breaking Castagne: Hardy VSOP Cognac, Sombra Mezcal, The Bitter Truth Chocolate Bitters, housemade Italian chestnut syrup, egg white, topped with fresh nutmeg. Richly textured, with a subtle smoke from the mezcal. 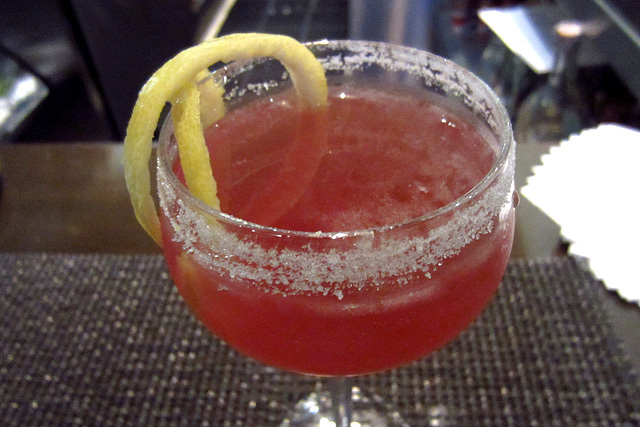 Mandeville came up with the name as a nod to the labor-intensive chestnut (castagne) syrup. Mandeville pays tribute to Shearin (and his love for all things Disney) with the Dead Man’s Tale: Wray & Nephew Overproof Rum, Bombay Gin, Bertagnolli Grappa, oloroso sherry, Bitterman’s Amer Nouvelle, St. Vincent’s Orgeat, lemon, orange juice, Galliano mist. There’s a lot going on in Mandeville’s take on the Fog Cutter, but she pulls it off. Next up was another cocktail shout out, this time an ode to Sam Ross dubbed the Remedy X: rosemary-infused Bushmill’s Black Bush Whiskey, ginger-infused agave, lemon. 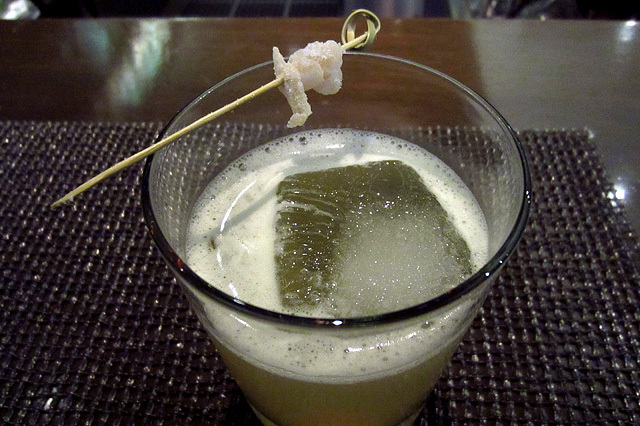 A nice variation on the Penicillin, with a ginger bite that was just what the doctor ordered. And finally, the Eve’s Demise: Black Grouse Scotch, Belle de Brillet Pear Liqueur, housemade hibiscus apple cider, maple syrup. 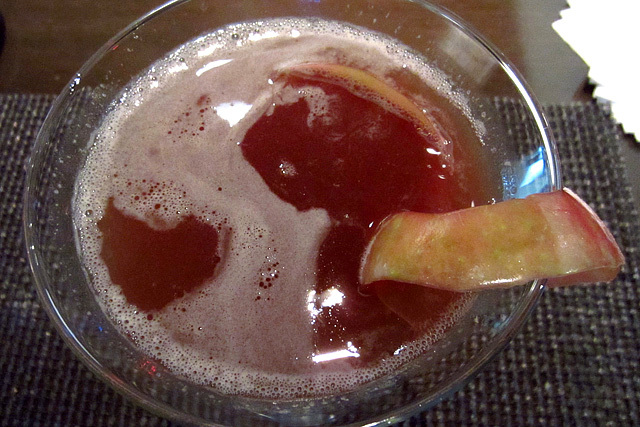 Mandeville explained that she had been looking for something to incorporate the apple cider, which was made by bartender Jen Len. 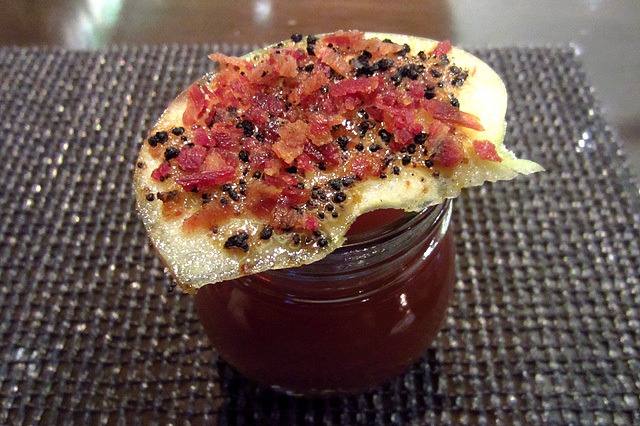 The Eve’s Demise is served hot, and while the drink alone is already an excellent winter warmer, it’s the “candied apple” garnish (apple, bacon and maple sugar) that really takes it to another level. To celebrate the launch of the Winter Cocktail Menu, Drago Centro will be offering drink specials on all of the new libations for one night only. 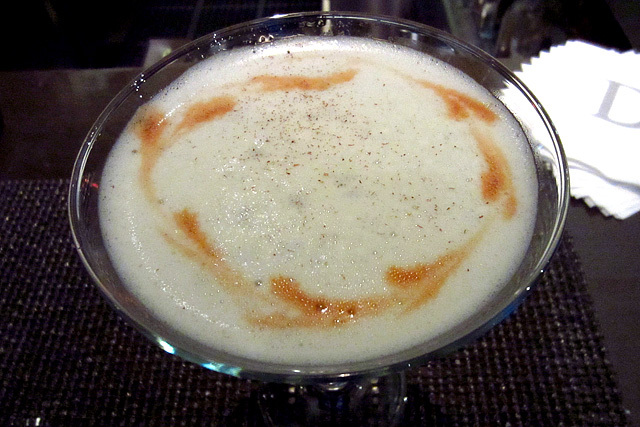 The signature drinks (normally $12 each) will be specially priced at $8 after 5pm on Wednesday, December 28th.